July 7, 2015 marked the 20-year anniversary of the filing dates of both the U.S. patent and European patent limiting the use of PolyEthylenImine (PEI) as a transfection reagent. Coincidentally, both U.S. and European patents generally have a term of 20 years from the filing date. Many academic researchers have been ignoring these patents and/or have been sharing protocols online and publishing articles explaining how cost-effective and simple PEI-mediated transfection can be. For example, the most commonly used PEI, catalog nr. 07923966-2 (Polysciences), is a linear form with molecular weight of 25,000 Da. The 2 gram bottle of PEI powder can be used to make a few liters of transfection reagent, so depending on which protocol is used the cost can be about 0.01% that of commercially-available transfection reagents. PEI is a simple polymer with an amine group and two carbon spacer that is thought to bind to DNA to produce positively charged particles that can enter the cell. PEI tends to be rather cytotoxic. While PolyJet™ DNA In Vitro Transfection Reagent is composed of proprietary bio-degradable polymers designed to greatly reduce cytotoxicity, standard PEI has been shown to induce apoptosis in a variety of human cells. PEI is difficult to dissolve. Linear PEI is solid at room temperature and somewhat soluble in hot water and low pH. A typical protocol might involve dissolving 8mg of PEI in 25mL of water, a process that may take many hours or days and/or result in a non-uniform solution that cannot be sterile filtered. To solve this problem, Polysciences has released the a much more soluble hydrochloride salt form (catalog nr 07924765-2), called Polyethylenimine “Max”, (Mw 40,000) – High Potency Linear PEI. This MW 40,000 form corresponds to the MW 25,000 polymer length in free base form, with the salt accounting for the molecular weight difference. Looking through the literature one might reach the conclusion that PEI is a universal transfection reagent suitable for transfecting cultured cells or use in vivo. 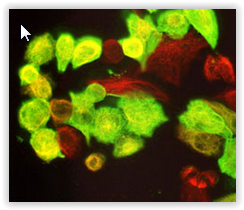 In addition to use as a direct transfection reagent, PEI is used for a variety of “combination” gene delivery methods. Adenofection for example makes use of PEI to permit delivery of large plasmids/BAC/YAC into cells by non-covalently coupling of the DNA to an adenovirus. A variety of other approaches make use of modified (e.g. PEGylated) PEI for gene delivery or have targeted PEI to specific tissues with antibodies or proteins. In the list of applications, mRNA delivery into cells seems conspicuously absent. Indeed at least one paper indicates that PEI-mediated transfection of mRNA is very inefficient. For mRNA transfection, researchers have better success with the Stemfect™ RNA Transfection Kit or the mRNA-In Transfection Reagent. HA tagged beta-tubulin cDNA was delivered into CHO cells. HA-beta-tubulin (Green) – Endogenous alpha-tubulin (Red). Leave your comment below to share your experience with PEI!